Help for Heroes was launched in October 2007 and, with the backing and support of The Royal Family, Celebrities, The Media and countless ordinary decent people, has raised over £1m a month since then. Help for Heroes is strictly non-political and has no affiliation with any political party. The money raised at Help for Heroes is used to support wounded Servicemen and women of every colour and creed. Help for Heroes has been chosen as the Charity Partner for The Tattoo, the money raised by the event will be donated to the charity to assist in the excellent work that they do. 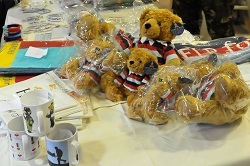 For more information on Help for Heroes, please visit their website.